Why no WiFi at Cambridge City Hall? I sent this email to the City of Cambridge today voicing my disappointment with the lack of WiFi available at our City Hall. Ironically when I pressed send I got a hasty response telling me that the address [email protected] had failed, so it seems like they launched their City Hall website and didn’t check whether the address on the contact page was actually functioning. So instead I emailed it to the Mayor, Council and Community Services. I was curious as to why there is no free wifi available at City Hall? I went there today to the Small Business Centre and found it to be closed for another hour because of a meeting. I tried to access the internet through my phone, but found that the big stone walls of city hall allowed for little to no connectivity through my Rogers iPhone. I know myself as a small business owner I would appreciate that I would be able to send and receive emails while conducting my business at City Hall. For a public space claiming to that “the future is high tech“, I would anticipate something that every coffee cafe in Cambridge can offer would be able to manage what has essentially become a common courtesy to offer patrons. Is there currently a plan to implement wifi in Cambridge City Hall, and if so when? In building a beautiful new facility like the one Cambridge has I would figure it would be the goal to want to bring people to use and spend time within the facility. Guelph is in the process of offering free wifi at their new city hall. Burlington already does. 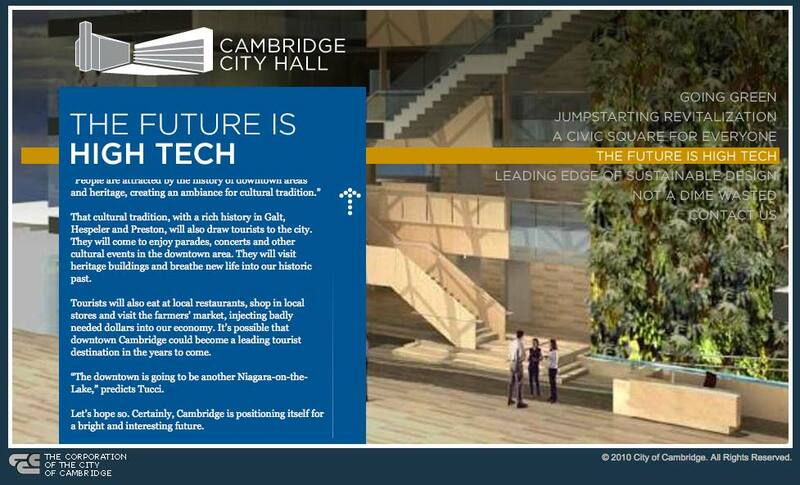 Cambridge needs to cater to their local technology community as the city looks to transition away from being a manufacturing based economy. Offering simple things like wifi in public places helps keep smart, technologically engaged people living in the area instead of losing them to more progressive municipalities. I’ll update this post if and when I get a response. Mayor Craig asked me to follow up with you regarding your note. We appreciate your feedback. As you can image, there are a number of services we provide through the Small Business Centre and most recently we upgraded the internet connections and provide a separate line, outside the city network firewalls so that entrepreneurs can access sites that are traditionally blocked by our network. I was advised by the centre that there was a sign on the door which would have directed you to the second floor to Economic Development division as there is only one staff member who works at the centre. Should you have needed the resources of the centre, it would have been opened for you where possible. City Hall is a Wifi hot spot for Atria, however, access is not free and you would require a stick to utilize the service. There are no plans to provide this service free of charge at this point because of budget impacts but I have passed along your suggestion to our technology services team. In terms of sending emails and using Roger’s service, I am not sure what might have happened for your system to fail. The City uses mobile devices from City Hall without issue and in fact, service throughout Civic Square has been tested on several occasions. Thanks for pointing out the old questions email. The front page of our website and other areas within the site have been updated, however, the section you reference is a separate website and I will be sure to connect with the team that manages this content – it’s an older site but still part of our online materials to give the history of the project. I really appreciate you taking the time to point this out. I hope I have answered your questions and would be happy to reconnect should you require anything further. As far as I’m concerned an Atria pay solution simply does not cut it. I understand that there is cost involved, but setting up a wireless router on the main floor of the building doesn’t seem like rocket science. Even restricted network service that blocks content is better then nothing at all.